Burrata really is one of my favourite items. 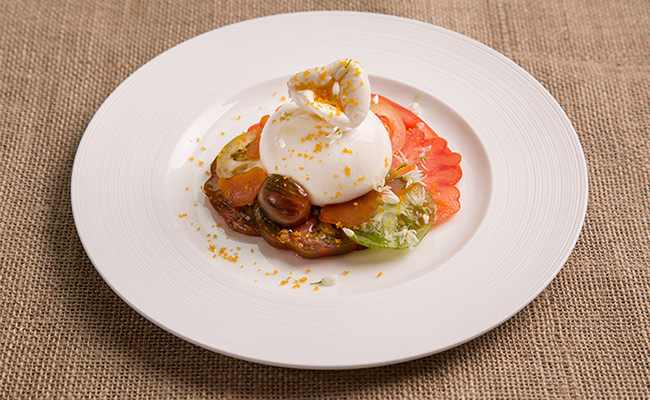 To give you the simple version, Burrata is mozzarella injected with cream, although the process is somewhat more complicated than that. They have a short shelf life and need to be used when fresh, but I adore the little pouches of decadence. You can pair them with so many ingredients too; Heirloom tomatoes are quite classic, so I add a peppery olive oil and slices of waxy, salty bottarga too. Bottarga is dried mullet’s roe from Sardinia and is great in pastas and fish dishes. This is really very simple, it’s not cooking but simply assembling the best ingredients. Firstly keep the tomatoes out at room temperature, then slice and cut them in all different shapes and sizes. I love to cut the big ones in thin slices to lay as a foundation and then build it all up with the smaller ones. Then drain the burrata off and place in the centre, drizzle with the oil, sprinkle with the basil and then finely slice a few pieces of bottarga on top and finally grate over some more. Then season and serve.